Some people use classic art prints to decorate the interior of their homes. Others go for the “arts and crafts” motif, or at least a vintage look. Others are more the “salt of the earth” crowd, and as it turns out, a good-size chunk of natural salt can be fashioned into an interesting lamp. 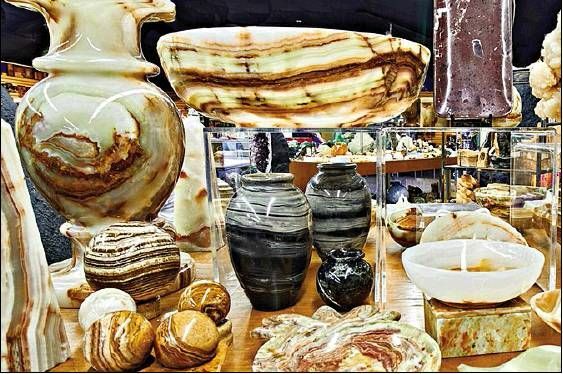 Karen Richards, owner of Nature’s Treasures, 4103 N. Interstate 35 in Austin, sees a lot of these people and deals in natural rocks, crystals, fossils and more that can be fashioned into all sorts of home-décor items. “There’s everything from plates and bowls made of banded onyx to amethysts so large you could sit inside them,” Richards said. “Lamps are huge things, especially the Himalayan salt lamps. “Some folks have the metaphysical belief that rocks represent different things, like amethyst is for healing or rose quartz represents love, but we have a huge customer base that just loves bringing nature into their home.” Many customers also choose rock selections to use in conjunction with house plants for an organic indoor feel. “We spend so much or our life indoors, so it’s great to have just a beautiful one-of-a-kind piece of nature there to kind of remind you,” Richards said.